Now that the days are getting longer, we can all enjoy long afternoons and sunsets. One of my favorite pictures to take at sunset is a silhouette. They are actually quite easy to accomplish. The first step is to find a “clean” source of light for your background. A hilltop works great! The colors of the sunset or sunrise will add dimension. You want to be able to see your subject in front of the sky or light source without other objects (like trees) that could distract. For the purpose of this post, I will use the term “sky” as my light source. Remember you are going for a fairly solid object with little details. Most of the time, I crouch or lie on the ground to remove the clutter of the horizon. Next set your camera’s exposure to darken the subject. You can do this by setting the exposure on your subject and stepping down several f-stops or you can set the exposure on the light source and adjusting from there. If you are not familiar with f-stops, try adjusting the shutter speed (faster is darker) or the aperture (smaller apertures with large numbers create darker images). Using the light source for exposure is probably the easiest. Either way, you may have to play with the exposures to insure that you are not “blowing out” or overexposing your sky and that your subject is dark enough to become a silhouette. Be sure that your flash is turned off for these pictures. In the picture above, there are no other objects to distract so the feminine lines of the lady on the hill stand out. 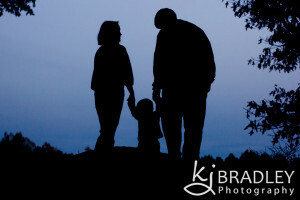 Below, I used trees to frame this family with their toddler. The trees give a more protective feel. Be observant of bright spots in the sky and place them strategically or change your angle to avoid them altogether. In the picture below, the sun is purposefully placed between the kissing couple. This picture was taken at sunset so the sunlight is still diffused by the atmosphere and wispy clouds preventing too much sunflare. Be sure that your focus point is on the subject, not the background. You will need to decide whether you want your silhouette to be completely black or if you want some details in the shadows. The photo below, was taken in tall wheat grass which made the outline of the goat less obvious than desired. 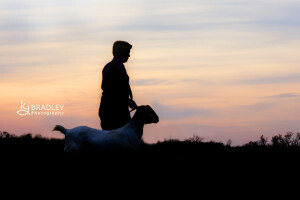 To make sure the goat was identifiable, I kept a few details in the shadow by darkening the boy further in Photoshop. In many cases, I do some fine tweaking in Photoshop to complete the look. It is also fun to enhance the colors of the sky in Photoshop. The picture below was taken with a point and shoot camera using the scene selector to get the best look. The the image was edited in Photoshop to increase the contrast. 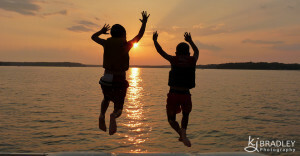 I won’t tell you how many times my boys had to jump for me to get the image exactly as I envisioned it. As you can see from the few examples given here, each silhouette style creates a different look and emotion. Play with the sunsets and see what you can create. I would love to see your images. Feel free to e-mail me or post them on my facebook page.